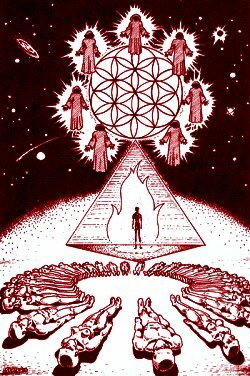 In my essay ‘The Secret Knowledge of Nibiru’ I described the possible connection between the Dark Star and the Eighth Sphere of the Theosophists (1). It seems that this Eighth Sphere was once a closely guarded secret of Madame Blavatsky’s Theosophy school, itself an already rather esoteric discipline. However, the Theosophist A.P. Sinnett publically drew attention to a belief held by Inner Order esotericists about an invisible Sphere which was counter-balanced by the Moon (2). This revelation isn’t exactly news, of course, as Sinnett’s faux-pas was made at the end of the 19th Century. But it may have some relevance to my own research into possible ancient Dark Star symbols contained within esoteric lore. In the top centre sits Vajradhara, flanked by Gedun Drukpa, the first Dalai Lama (left) and his disciple Panchen Zangpo Tashi (right). In the bottom corner are two of the great stupas, on the left Budhgaya (India) and on the right Borobudur (Indonesia). The principal beings are the five Dhyani Buddhas – the esoteric meditation Buddhas of the five colors found in The Tibetan Book of the Dead and other sources. 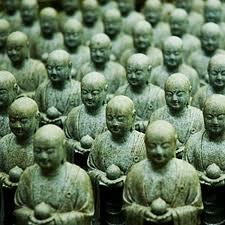 The deities are not Buddhist Gods, but rather different aspects of the one God. Among these are several teachers or gurus, who have attained notoriety and importance, and as such are venerated. Like the Hindu Deities, these are meant to express particular aspects of the Infinite, and are are used as devotional images helping the seeker visualize, concentrate on, and thus in time attain, that aspect of the Infinite in him or herself. 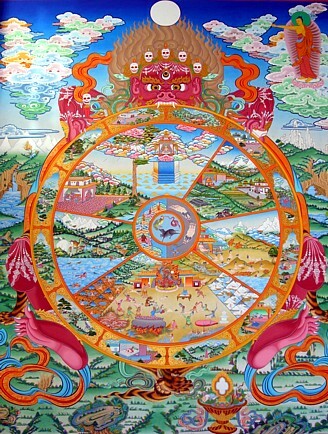 Each of the deities represents a unique spiritual personality or essence. There are two main traditions of bodhisattva vow: the tradition of Profound View, coming from Nagarjuna, and the tradition of Vast Conduct, coming from Asanga. In Asanga’s tradition the vows of bodhichitta in aspiration and bodhichitta in action are taken separately, whereas in Nagarjuna’s tradition they are taken together.